Backup window is a particular time when the backup action makes no disturbance for any typical computer-related activities such as computations and user operations. Running your backup task during a backup window is a way to make both convenient and consistent data snapshots. What is Backup Window Term Meaning? A (relative) relieve for many or most computer-related resources (including a network traffic, a computational power, peripheral devices and so on) from other tasks. Availability of any resources needed for backup: storage devices and capacities, network connections, power, personnel (if you still need a staff for backup!) and other. Guiding by these two criteria, you can select a most appropriate “backup window” to your particular task. For example, a classic backup window is an interval of an hour or two after ending a workday in an office, when a staff finishes all daily jobs, and you can save the fresh results of these jobs. 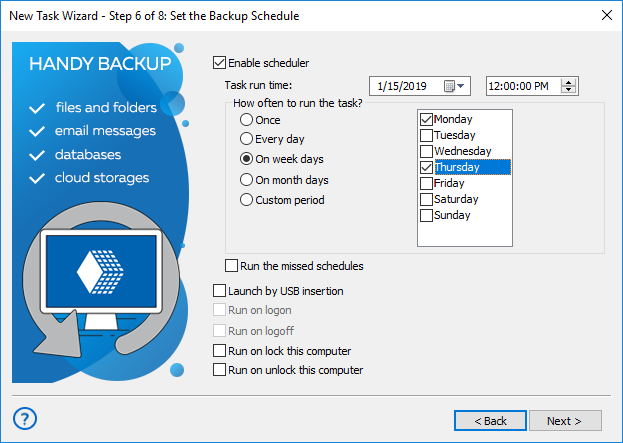 After you set up a backup window, you can use backup scheduling to automate running your task during that time. In Handy Backup, the program makes any scheduling operations by itself, requiring no external schedulers. Note: For different tasks and backup datasets, there must be a different backup window for each task type! Avoid situations when you schedule all your backup tasks to the same time!